Safely store your products with this Cambro RFS4148 4 qt. round food storage container! 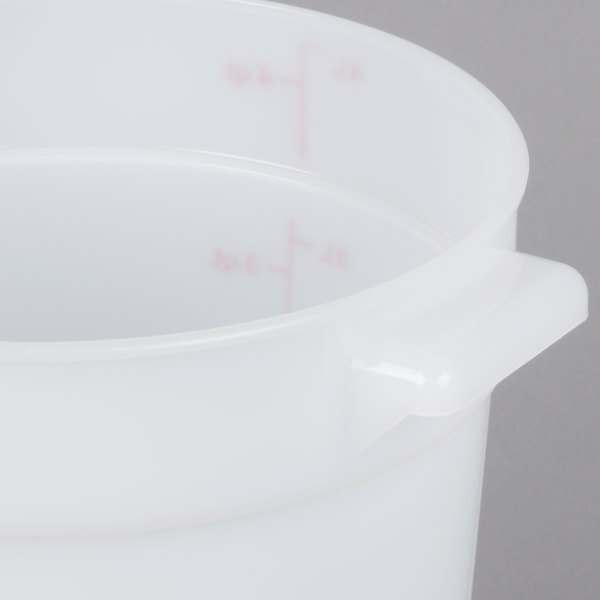 Exceedingly versatile in both size and design, this container is perfect for portioning and storing all your ingredients, toppings, and pre-prepared foods. Simply pair with a compatible lid (sold separately) to keep your foods fresh. 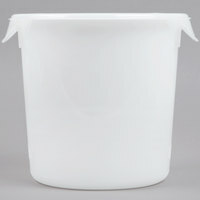 Its solid white color makes the container easy to spot in a crowded refrigerator or dry storage room, while a 4 qt. 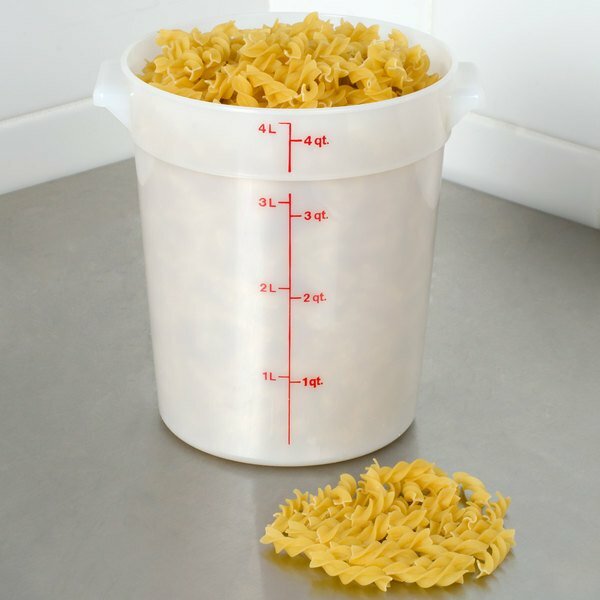 capacity provides users with the perfect storage amount for extra servings of your favorite recipes! "These containers keep my perishable ingredients fresh while in the fridge and keep my dry ingredients safe from pests and moisture. I can't say enough good things about them." 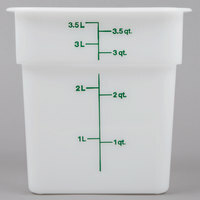 The Cambro containers are one of my favorite items that WebstaurantStore offers. They can be used for storage in our pantry and refrigerator. They are made very well and I have no complaints. I have never used Cambro products before but I think they are going to hold up well! We have a lot of spaghetti sauce items and they tend to ruin containers, so far so good on these! Have measurements on the outside really helps you know how much ingredient is left in it. Great for dry and wet storage. Able to be used in a fridge, freezer or in the pantry. This food storage container has been a life saver! In the past we use foil pans to store our foods but with this container we are able to save food and still keep the freshness. Already looking to order more of these containers. Awesome! Awesome! Awesome! Cambro is top quality and very worth the money. The container does not hold smells from items that have been stored in them. The 4 quart container is perfect for my green coffee beans. I am able to measure, stack, and transport with confidence. Purchase the lid for a tight seal. This to us was a wonderful purchase and the use of the lid combination. We store so many items in it in our pantry and use the masking tape we also purchased from WEBSTAURANT to mark what is in the container. 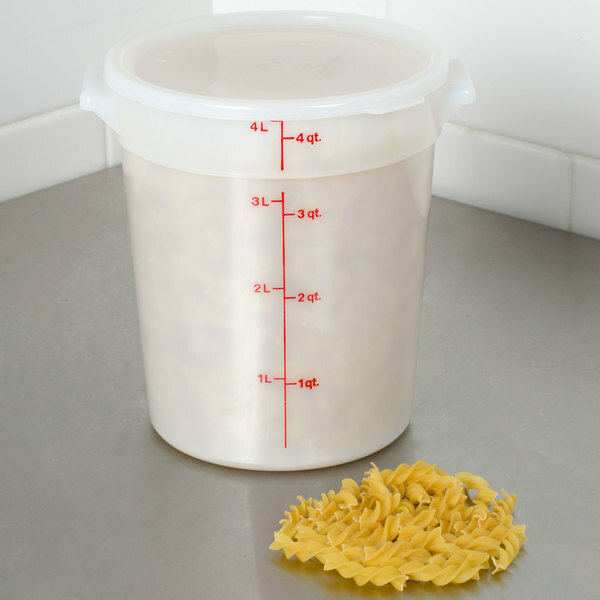 Makes your life more simple ton use these containers this way. And the price??? What can we say? Truly a great purchase for any business or home. These containers are great! The measurements are clearly marked. They are thick, sturdy plastic that will not crack or break if dropped. I particularly love these for use at home to organize our pantry. They are "white" enough that everything looks clean and organized, but are still slightly/barely see-through enough that I can tell the difference in the kids' snacks (veggie straws vs popcorn) without having to open each container. For our business (bakery & coffee shop), I prefer the clear containers just for visual ease without having to look at the labels (chocolate chips vs raisins) . Fantastic containers and lids (the clear and white lids both fit these containers equally well). I would highly recommend for home or business use. They can definitely stand up to the abuse! This is a nice container. I think it is made well and i believe it will hold up over time. I am overall happy with it. 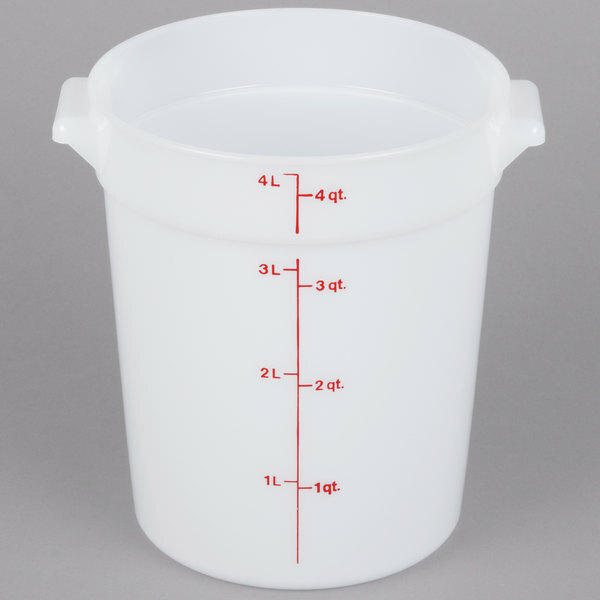 Perfect for container for measuring out my ingredients, easy to clean and transport batters for one location to the next and holds the temperature of the product. 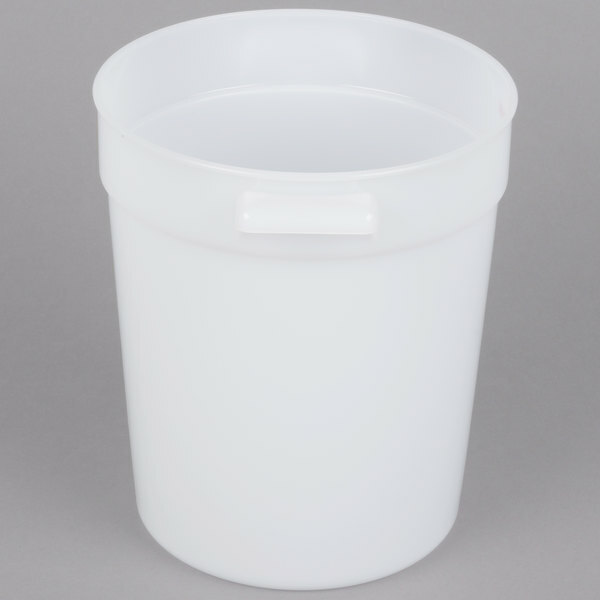 This 4QT round food storage container is made of BPA free plastic. 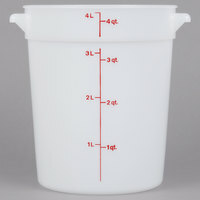 The food storage container is also dishwasher safe which makes cleaning up a breeze. We like to have multiple types of storage containers on hand for our events. 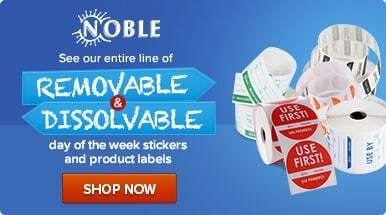 This is a great value any great quality product. Freezes great in a blast freezer. Very sturdy product and doesn't warp or cause any weird tastes in food. Easy to clean and doesn't stain. Fits well with the lids available for purchase. Great deal overall, would buy again. This food container is a great size. Four quarts of whatever leftover soup, stew, sauce, or gravy that you may have is right here at your fingertips right before the holidays! These hearty beasts are great for storing and stacking in the fridge. The only downside is how easily the lids come off. Not the best if you want to take liquids to go. 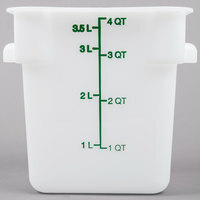 I purchased th 4 qt food container to mix small batches of soap batter in, they are soapemakers dream. Plan to purchase more of them. 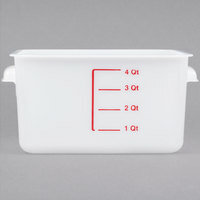 Another great storage container from Cambro. 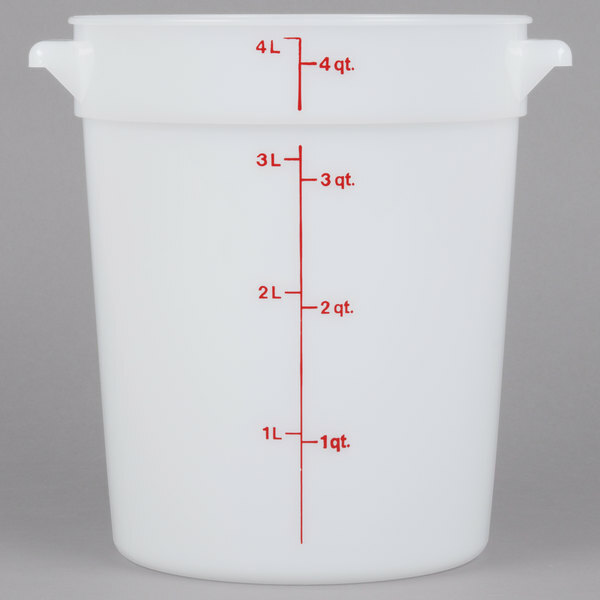 This is the perfect size for holding nuts, specialty flours, and ingredients that I want to be readily available but don't need huge containers of. The 4 QT is great for small storage. I used mine to put the small leftover batter. Can easily fit it in the refrigerator and doesn't take up much room. I really like the Cambro storage containers. Numbers easy to read, nice size. I keep flour and sugar in mine. Very thick material. Not flimsy at all.